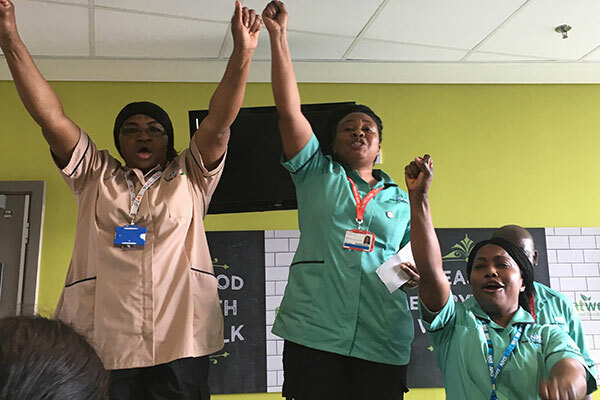 Cleaners, porters and domestic staff employed by Serco have rejected a pay increase of just £2 extra a week, and are demanding a rise of 30p per hour. The hospital staff have already been out on strike in June and July, but talks with Serco have been unproductive. Serco won a £600 million contract for services across the trust, and reported profits last year of £82 million. The majority of the striking workers earn just above the London “Living” Wage, and many have been forced to work second jobs in order to get by. Staff have also reported massively increased workloads and worsening working conditions since being taken over by Serco, leaving vulnerable patients at risk. Staff involved in the dispute have been holding vibrant pickets during earlier strikes, and also held a successful wildcat strike earlier in the year after Serco tried to remove their scheduled breaks. If talks today between Unite and Serco do not secure a higher wage for the staff, they will walk out on Friday – Tuesday on August 18 to 23, August 25 to 30, September 1 to 6, September 8 to 13, and September 15 to 20. The strikers are a mostly migrant workforce, but their union leader Len McCluskey, a major Corbyn supporter, has called for restricted immigration controls. Serco check the immigration status of their workers and get them deported, as well as running a number of detention centres in the UK and internationally. Their CEO is Rupert Soames, grandson of Winston Churchill, who earns £850k/year plus bonuses. If talks today between Unite and Serco do not secure a higher wage for the staff, they will walk out on Friday – Tuesday on August 18 to 23, August 25 to 30, September 1 to 6, September 8 to 13, and September 15 to 20. This union warning will give Serco the opportunity to hire agency workers to break the strike. Occupying an agency office - as was tried before - will not prevent this. The 30p per hour is one of the least aspects of this strike - it's also in response to long working hours and management bullying. There was a wildcat strike and canteen occupation a few months ago when Serco cancelled a 15 minute morning break - it was reinstated after the occupation.